It has recently come to my attention that the Ringling Bros. and Barnum & Bailey Circus has been billing itself as "The Greatest Show On Earth" for some time now. 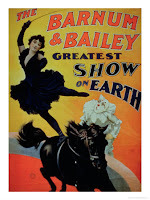 Now perhaps, by Victorian entertainment standards, when Ringling & Co. would schlep from farm town to brier patch in brightly colored boxcars and make animals in sequined hats pirouette for home-sewn corn babies, you might be able to argue that it was "The Greatest." But this is 2009, pals. We've got Beanie Babies and Pogs and Four-Slice Toasters. We've got Gloria Gaynor and Power Rangers, OK? We've got Snuggies. There is a lot more competition to be "The Greatest" today than there ever was in the 1926 rear parking lot of the Kenosha Woolworth's. If I want to see clowns and animals dance around for two hours, I'll just turn on C-SPAN. OH SNAP! BLANKET BI-PARTISAN POLITICAL BURN! MacGyver wouldn't misspell "Greatest" in an advertisement.